SPOKANE, Wash. – A 25th anniversary celebration for Washington State University Spokane will be held outdoors under a big tent on the campus 5-7 p.m. on Thursday, Sept. 25. Cost of attendance is $25 per person, with proceeds going to student scholarships. Guests will be asked to RSVP in early September. 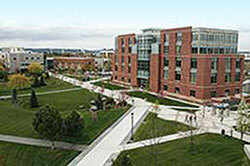 WSU Spokane was one of three regional campuses created by the Washington Legislature in May 1989. The others – WSU Vancouver and WSU Tri-Cities – also have anniversary celebrations planned this year. WSU began offering courses in Spokane in the 1920s. When the Spokane campus was officially established, it was located in leased office space downtown. WSU Spokane is located on a 48-acre campus in the University District. It employs 400 and had $19 million in new research grants in 2012-13. More information about the campus can be found online at http://www.spokane.wsu.edu.